Navigating an airport that you’re not familiar with can be a challenge, especially if it’s a big one and you have to make a connection during a short layover. Luckily, airports are designed to be navigated quickly and efficiently, and here’s a quick, handy guide to fill you in on all you need to know about John F. Kennedy International Airport serving New York City. Now, here’s the most important thing to know if you’re trying to make a flight. How many terminals does JFK have, and how do you get from one to the other – FAST. JFK has six terminals, numbered 1-8, but skipping the now demolished 3 and 6. Navigating the terminals is a snap, with the AirTrain system connecting all of them – with short rides and a train frequency of only two to five minutes. A free shuttle is also provided for fast access between terminal 2 and 4. Each terminal has plenty of stores and restaurants, so no need to grab anything before you hit security on your way into the airport – which should save you some time if you’re running late. Here’s where One Stop Parking comes in. If you want safe, convenient parking plus hassle-free shuttle service from your spot to the airport, we can’t be beaten, especially in such a high-frequency airport. However, there are other options for JFK if you opt not to drive, with the AirTrain connecting Manhattan and the airport via the subway. Air train service is available 24/7. There are tons of dining options in all terminals, both before and after security. Of course, if you’re catching a flight and want a stress free pre-flight experience, heading through security and to your terminal is probably your best bet. There’s a wide variety of food to choose from. According to NY Eater.com, your best bets include Shake Shack/Blue Smoke on the Road (Terminal 4), which feature a ton of great pub food and is a great place to watch some sports on their big screen TV’s between flights. For a more relaxed, sit-down experience, try Uptown Brasserie (Terminal 4) or Parisian restaurant La Vie (Terminal 5). Notably, Eater called Deep Blue Sushi (Terminal 5) the best airport sushi restaurant they’ve sampled, making that a must-try, but to be sure, every terminal has plenty of options to choose from. 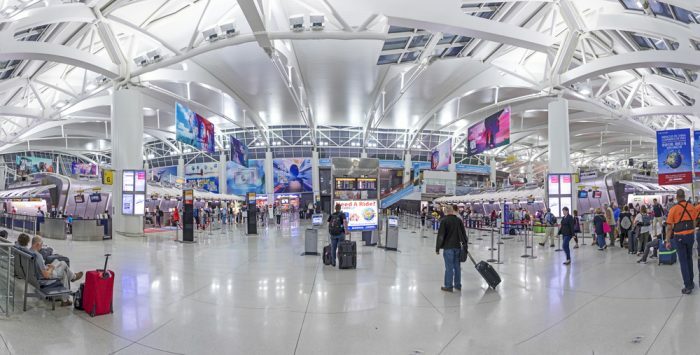 While huge, high-circulation airports such as JFK may be imposing, don’t forget that they are well-equipped to handle the huge number of travelers they serve every day, so even if you have a tight connection, don’t stress! It’s easy enough to navigate if you’re well-prepared.